These three screen grabs from an iPhone show how to access real-time bus arrival info on a cell phone. I know that many readers of The Source have been asking about this recently, so here’s some good news: Metro today began testing a real-time bus arrival system called Nextrip. It’s important to consider that this is a test, with Metro tech staffers monitoring some users to see how the system is working. Nonetheless, the system is out there and online, so I wanted Source readers to know about it. Metro customers can access the real-time data on the Metro website or on their cell phones, which is especially convenient. It’s also possible to get the information via text message if you don’t want to fuss with the Internet. For those unfamiliar with real-time bus arrival systems, it’s pretty simple. Let’s say you’re at the bus stop at the corner of Hollywood Boulevard and New Hampshire and want to know when the next Line 180 bus is going to arrive. The real-time system will tell you how many minutes until the 180 shows up and how long until other bus lines serving the same stop also arrive. Pretty neat, eh? It’s a lot better than trying to download a pdf timetable onto a cellphone and trying to find when the bus is scheduled to arrive, which in the real world is not always the same as when the bus actually arrives. Testing will be ongoing for a while. But it’s very good news that Metro is close to rolling out the system. The effort began last March when Metro invited vendors to submit bids to install a real-time system. Then in September, Metro’s Board of Directors selected NextBus as the vendor and awarded them a $1.65-million contract, with the aim of going live in early 2011. Enjoy the real-time info and let us know how it works. The screen grab below from the Metro Nextrip website shows the various ways you can let Metro know how the system is working. We’ll also make sure that any comments left on The Source are forwarded to Metro’s tech squad. Excellent, thanks for working on this! awesome – I’ve been waiting for this – psyched to see it. But I’m not clear – what’s the app to use for a iphone for LA next bus arrival? I see next bus app for not for LA. Can we download this as an iPhone app? If so, what’s the name of the app? It’s not an app. Just add the website to your home screen just as you would an app — go thru the bookmark function. This is EXTRAORDINARY news for bus riders that will literally make for dramatic improvements in our quality of life. The most frustrating thing about riding the bus is waiting and waiting ten, twenty, thirty minutes, not knowing when the bus will come. Now, with this, one could step away and go to a store or something if it’s going to be a while. A HUGE thank you to Metro for doing this. hooray! I was using this 10 years ago in Seattle, I’m looking forward to some apps eventually. I particularly love the map, which shows the location of every bus and all the stops along the route. It shows just how many buses are needed for busy routes (20 for the 754, right now), and whether the buses are bunched up or nicely spaced out. Please build a smart phone app, and also release the database publically, so other developers can build smart phone and PC applications with this information. I’d like to use the text messaging facility, however, I can’t read the signs on the streets to even get a bus stop number. Is there a list online, preferably in text, HTMl, etc. where I can get the lines I need such as 150/750, 245, 165, 242, etc.? I tried one of the text messaging services on one of the pages on the site and could never get it to work, and 511 seems to not have it correct either, although 511 is speech which is good, but in loud environments, doesn’t quite work. Best thing to do is mail me as this will scroll of the main page for me. But thought I’d put it here for people. I’ll bookmark the page for better access for a little bit. This is great news. I just tested it out for the 720 and it was pretty accurate. One big problem though. What’s up with this stop number nonsense? Why not let it use the phone’s GPS to find what stop you’re at? That’s how the transitly.com webapp works. I love have real-time info, but all that scrolling takes longer than just waiting for the bus. My first-gen iPhone (which doesn’t have GPS) simply asks to find my current location when I open the mobile NextBus website and then it tells me when the next bus is arriving at the nearest stops. So far, it seems to be working pretty well near where I live and ATT coverage on EDGE network here is often pretty spotty. I did find an ADA version which is simpler to use where it takes you through the system by bus number, so that can work too, but knowing the bus stop number I don’t see where that might be located although it did say Topanga/Alhama was 6550 I believe when I did it on that page. Is this when buses are scheduled to arrive or is this also keeping track if a bus is behind and such? Re: finding bus stop numbers. Right now, you can find this by going to the website, then pick the line and direction you want, and the intersection. That will give you the stop number, which you can then use to get info via text. I agree that this should be done by the application. Perhaps a smartphone app can include this feature? What if the phone like mine doesn’t have GPS too. All I’d like to do is if I know where I’m at, put it in, let it give me the lines, and then what times or how long. That works for me. This sounds interesting, but is it accurate? How about those displays at Rapid bus stops (that are supposed to tell you when the next bus is arriving) – half of the time, they are not working. The other half of the time, they are inaccurate (shows that the bus is arriving, but it doesn’t come for several minutes; or shows the next bus will come in 10 minutes but it’s right there in front of you). Hey Steve, I have a quick suggestion. This service should also provide information about Metro Rail lines as well. I realize they probably run massively better on-time performance, but it would be nice to have all of that information in one place. Even if the rail arrival times were just schedules and not GPS, it would still be good to be able to access the train information right alongside the bus information. For rail schedule times, try the iTrans Metro app. I have it on my iPhone, I don’t know if it’s available for other types of hones. But it’s easy to use and quickly delivers scheduled rail arrival times; because they don’t have to deal with the vagaries of traffic, the trains are mostly on time. Cassie, those Rapid bus displays use a different system to predict arrival times… linking in with the transit signal priority system. Essentially, the displays were making predictions based on when the buses hit the loop detectors along the way. NextBus uses GPS instead, which is more accurate because it can be updated between loop detector locations. It would be nice if those Rapid bus displays could be repurposed to show NextBus predictions. Another way to find the stop ID is to look on Google Maps. When you zoom in and click a transit icon, it will show you the stop ID as well. nextbus provides a public API for some cities. Will they be providing that for LA/Metro? If not, why not? Having an API lets developers do great things with the data, such as write apps. We’ve had NextBus on AC Transit and SF Muni in the Bay Area now for years and it’s great! It is provided and therefore, my website, TransSee, now supports LA Metro. I expect other websites and apps will appear in time. @tedder – Of course the NextBus XML feed is available for L.A. Does this “Nextrip” involve entering the NUMBER of an individual bus stop (which MTA bus stops DO NOT HAVE-unlike in O.C., which DO have them)? Can this system PLEASE be “trial-tested” at El Monte Station?? John, as indicated above by me and others, Metro does have stop numbers, and they’re quite easy to locate. I love Nextrip or NextBus, – whatever it is – this is completely changing my life. Steve, you’re right. It finds me! For some reason, my iphone was taking me to the full website rather than the mobile, but now I’ve got that sorted. Wow, this is very futuristic stuff. This is great! Just wondering if there are plans for other bus lines in the Metro system (I’m particularly interested in Montebello Bus Lines) to adopt NextBus? Is MTA looking at inviting other systems to participate? This would make it a more complete solution if one leg of your trip uses another transit system. Do you need a stop id number to use the system, or will it work with a stop name (5th/Spring, for example). Chattanooga, TN has a system like that that uses stop names; the only drawback is sometimes a bus falls off the system. 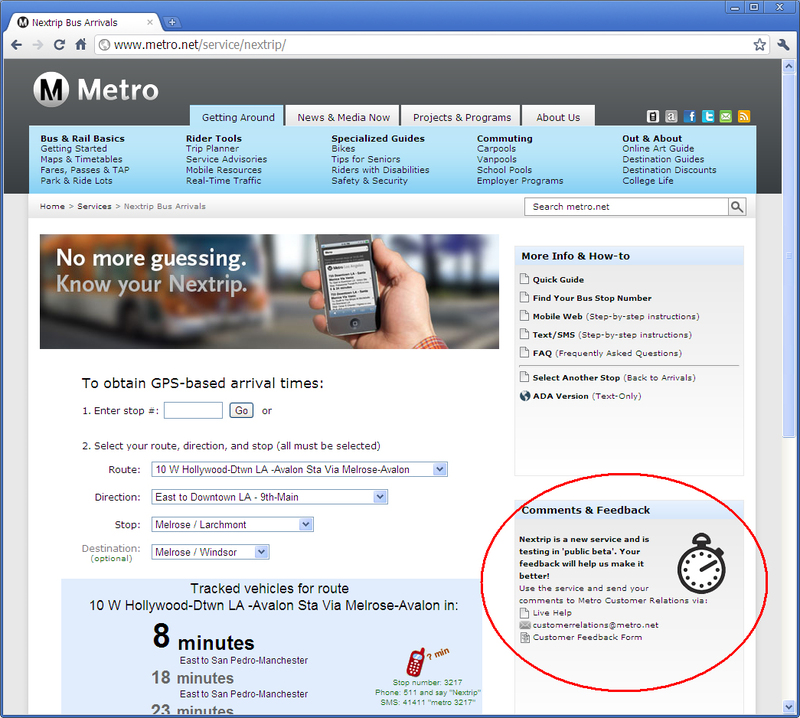 On the Nextrip page on the Metro website, you can enter a stop number OR find your stop via pull-down menus. The stop number is a quicker way to get the info. On the mobile version of Nextrip, you can either allow your phone to automatically locate the nearest stops and bus lines or you can manually select a stop through a series of menus. If you need your stop number, you can find it here. How is this different from using the google maps transit directions? So I found out today that 1-800-commute will be discontinued and when calling it, it is saying so. I used 511 and asked for the next 150 going home and was able to provide a bus stop of where i was and it said 1 minute and sure enough it was on its way. But Steve didn’t answer whether or not there is an accessible way for the disabled like myself to get this information. Tried to do text messaging, but I’ll look up the text messaging again, think I got the wrong code. Thought it was 41411 or something like that, but that number seems to go somewhere else and the queries were returned as invalid. So, telephone it looks like 511 will be the way to go. Saddened by this. Steve, editor, can you get in touch with me? Andrea – Google information is static schedule information =- The Nextrip information will be predictions based upon real-time information using GPS on the buses. With Nextrip, you really won’t need the schedule because you’ll actually know/see when the bus is coming. Please give the service a try, your feedback is much appreciated. If you’re a mobile user, please use our mobile website – http://m.metro.net – the Nextrip service is linked here and it will direct you to mobile versions of the service (GPS-enabled or manual selection). We’ll be integrating the arrival data in the next version of our Go Metro mobile application, due later this year for both iPhones and Android devices. The current web application is accessible from any mobile browser with internet connection. I read the text messaging page, and it links to where I could get the bus stops, but that page says to use google maps. I did find a master list somewhere in HTML format, but now wouldn’t remember where. But I have been able to get trip information by putting in the streets, e.g. Desoto&Ventura and it does return the results by asking which bus if multiple, and so forth. But even then just me trying it out for the first time was a chore, giving it commands and it not recognizing them. I tried metro to metrola to some I found in a list of commands for metro I found somewhere linked from that nexttrip page. I just got around to reading this. It’s a great start on a more sophisticated version that will undoubtedly tie into GPS capabilities on smart phones. It’s important to note Next Bus doesn’t work yet for rail lines (why, I don’t know), although it does for the Metro Orange Line. First of all, it appears that the Metro Web site has combined the Trip Planner and Next Bus functions into the same link from the home page. Makes sense and saves space on the home page, but you need to know that or poke around a bit to find Next Bus. In both cases, I’ve learned to use the simplified version for my iPhone (Next Bus calls it the “ADA Version;” Trip Planner calls it “Simple”) because they load faster. Also, if you have an iPhone, it’s easier to do you what I’m going to suggest in Safari on your computer and then synch that between your computer and iPhone. Since, like any people who use the same Metro bus or rail stop, this is my workaround to shorten the time needed to use either Trip Planner or, now, Next Bus. In the case of Trip Planner, what I need to know most of the time is when the next Gold Line leaves from Highland Park, either northbound or southbound. When you plug in a route that doesn’t involve more than one bus or train, Trip Planner gives you the entire schedule from Point A to Point B. In my case, I plug in leave Highland Park south to Union Station, weekday, and I get the complete schedule for the day. I make a bookmark of that and put it in a folder marked “Gold Line.” Then I do the same thing for weekend and make a new bookmark. Then I create a bookmark for Gold Line Northbound weekday and another for Gold Line weekend. (I often leave to go home from the Del Mar Station, so I’ve also added bookmarks for the southbound trips weekend and weekday. That puts six bookmarks in one folder, so I can easily find the appropriate route I want). The process is similar for Next Bus. For me, it means finding the 256 bus north from my nearest stop by using the longer version (find your bus, find your street), noting the stop number, then make a bookmark and put it in a folder marked Next Bus. Two things I like about Next Bus: the bus stop number is the same, no matter the line using that stop and (2) in addition to the bus you requested, the system gives you every bus leaving from that stop. Moreover, the system automatically refreshes whenever you reopen the bookmark (you can hit refresh if you’re not sure). Knowing when the next bus is scheduled to arrive is of little comfort. Afterall, if yourinformation shows it arriving in 30 minutes and you need to get somewhere or make a connection before then, what do you do? My point is that this ystem helps no one except Metro to know how well the schedule is operating. You cannot hurry up the bus or change the schedule in any way. You still have to wait for it to arrive, and if it does not get to you when your info says it should, then you are upset with the bus operator and there goes the argument. There is an old saying: Buses don’t wait for people; people wait for buses. Give yourelf enough time to account for bus breakdowns, traffic condition, and other occurence that may affect the bus’s arrival and you schedule. As someone with many years of all sides of the issue, your apps will notget you to work, or home, or to that important any sooner. Your good planning will. To add to my previous comment. A better system would be what was in operation during the first years of Rapid Bus. A real time arrival time for buses located at the stations. All pasengers, including those without iphones, like me and those who cannot afford one, can get the same information. It may be surprising many of you to know that most people who are regular bus and train rider don’t have these pocket devices, and rely on the services provided by metro through their customer service department. So let’s thing out of the box. Technology is fine, but the bus system is considered basic service, and and deigned to accomodate all riders. The system must fulfill that need in the best way possible. This NextBus app, only services SOME riders, and mostly those who have options in using public transit. When we design a system that helps everyone, then we are on our way. Paul, the response from riders using NexTrip has been overwhelmingly positive. I know that personally as a bus rider the simple fact of knowing when your bus will actually come as opposed when it’s scheduled to come is a great way to put my mind at ease – even if the bus is late. I can at least have the peace of mind of knowing realistically how late I’ll be. Even if you don’t have a texting plan, if your mobile device is capable of making calls you can dial 511, say “nextrip” and follow the voice prompts to get real time arrival information. FYI: Metro’s most recent rider survey reveals that 75% of riders are equipped with some sort of mobile device, and 50% of those are equipped with smartphones.